Every geographical name, particularly in India, has a heritage behind it. So also has Orissa. But Orissa’s council of ministers is conspiring to tamper with this glorious role of heritage. When none of his cabinet colleagues has any esteem as a person of Oriya letters, Chief Minister Navin Patnaik himself does not know Oriya. And these fellows together have decided to change Orissa to Odisha and Oriya to Odia in English and to ban Udisa and Udia in vogue in Hindi and other Indian languages! Obviously these fellows are not aware of Orissa’s heritage and do not know why Orissa’s name in English is Orissa or in Hindi is Udisa. They also do not know that Udisa, Udisya etc are also Oriya words. On coming to know of their agenda for the change, as a son of Orissa, proud of her heritage, I had posted mails to the CM and all the members of his council of ministers with documentary support urging upon them not to proceed with their scheme. But, they have not paid any heed to my just and proper request. It prods me to place before you why the name “Orissa” or “Udisa” needs not to be changed but to be retained. I will begin with Udisa. Udisa is derived from the word Udra Desa or Uddiyana. King Indrabhuti of Uddiyan of 8th century, founder of Vajrayana, the Uddiyana Tantra, was the first to have propitiated Gurudev Buddha as Jagannatha in his canon Jnana Siddhi following which the cult of Jagannatha has evolved. D.C.Sircar assigns this plate to middle of 10th century on paleographical ground. It means, amongst all the Pithas or Citadels of Tantra, the first is Udra and the second is Jalasailaja, the third is Purnapitha and the fourth is Kamarupa. The temple of Jagannatha is known as Sri Mandira or abode of Maha Laxmi. Kubjika tantra describes the land of Sri Mandira as Uddiyana: “Mahalaxmimaya pitha Uddiyanamatahparam”. Tantric canons are even captioned with the word Udra like Udramareswara Mahatantra that describes Sri Jagannatha as Uddisa or lord of Udradesa. So, derived from Udra Desa and/or Uddiyana, Orissa has assumed the name Udisa or Udisya. There is no wrong in it. Rather this word depicts Orissa’s glorious past as the fountainhead of political philosophy of matriarchy that had bloomed into Tantra. Orissa is known as Udisa or Udisya not only in Hindi and other Indian languages, but also in Oriya language. 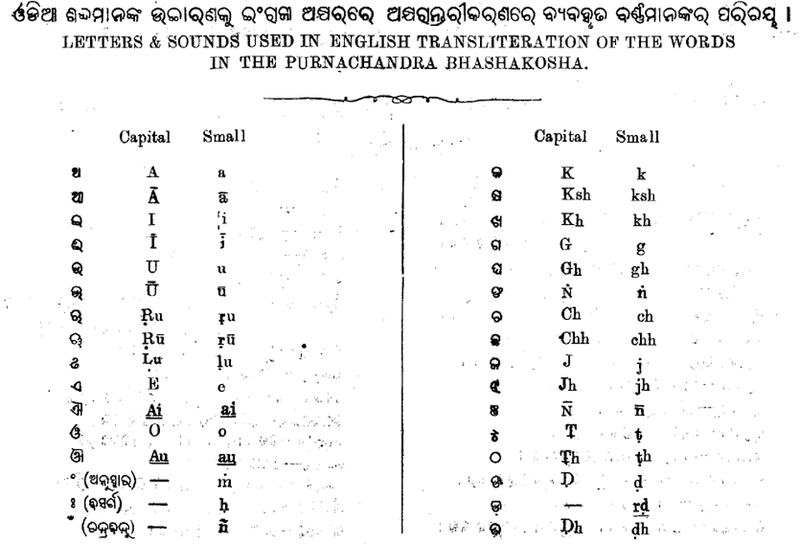 Purnachandra Bhashakosha, the final referral source book on our language describes Udisya as an indigenous noun (Deshaja Vishesya) of Orissa origin. When this word is a Deshaja Oriya word, developed by indigenous people of Orissa, who is Navin Patnaik and / or who are others to describe it as offensive and to insist upon its obliteration? Any body can become chief minister or a minister in a system like that of ours. Does it mean that Orissa’s indigenous name that carries with it its glorious heritage can be allowed to be tampered with? Anybody who loves Orissa by understanding Orissa must cogitate this question. Now let us come to the question of changing Orissa to Odisha. Had any in the Council of Ministers any knowledge on Oriya vocabulary, a resolution seeking such a change could never have been passed. “Oriya language can boast of a rich vocabulary in which respect neither Bengali nor Hindi nor Telugu can vie with it. The richness of the vocabulary is the index by which the vastness of a vernacular can be gauged”. “When an Oriya wishes to express the idea embodied in what in Latin would be called the initiative, he simply takes the appropriate verbal noun and declines it in the case which the meaning necessarily requires. As every infinitive must be some oblique case of a verbal noun, it follows that, Oriya grammar does not know the so called infinitive mode at all. In this respect, Oriya is in an older stage of grammatical development than even Classical Sanskrit, and, among Indo-Aryan Languages, can only be compared with the ancient Sanskrit spoken in Vedic times”. This emphatically suggests that other Indo-Aryan languages are much junior to or undeveloped than Oriya Language. “Of these three languages – Oriya, Bengali and Assamese – Oriya has preserved a great many archaic features in both grammar and pronunciation and it may be said without travesty of linguistic truth that Oriya is the eldest of the three sisters, when we consider the archaic character of the language”. So, Oriya, the very vast vernacular of India is uniquely rich and remarkable because of the archaic features preserved in its grammar and pronunciation. Navin Patnaik and his team of sophomoric ministers have resolved to do away with this archaic uniqueness of Oriya language so far preserved in its grammar and pronunciation by adopting a resolution to change Orissa to Odisha. The middle alphabet that they want to change in the vernacular word through this resolution is a peculiar alphabet that has two different pronunciations in two different positions in a word. When it is pronounced as “d” if placed at the beginning it is pronounced “rd” phonetically or “r” colloquially when not positioned at the beginning of a word. This is the archaic feature preserved in Oriya grammar. Navin Patnaik is unable to understand this. In my mail to him and to his cabinet colleagues I had attached excerpts from Purnachandra Bhashakosha that depicts how English transliteration projects Oriya alphabets wherein both the positions of the alphabet in question has been dealt with phonetically. I had further attached the inner page of this Bhashakosha to show how the phonetic “Ordia” has been accepted as colloquial “Oriya” by the reigning authority on words of our vernacular. But Navin Patnaik is also not able to understand this. I don’t blame Navin entirely in this matter. He has inherited his father in politics. His father Biju had invested money in politics and created a brigade of paid factotums who were engaged in his image building to hoodwink the people for capturing power and once elected he was corrupting the system so much that the people of Orissa were rejecting him for at least the next two consecutive terms. When out of power he was engaging his own scheming mind and his pack of sycophants to contrive and spread canards against his successors in office and to make gullible people entrapped to innuendoes that his successors were worse than him. This stratagem was helping him recapture power after suffering rejection for at least two terms. That he was using Orissa as a medium of fulfillment of his personal game plan, sans any real loyalty to her is unambiguously proved by the very fact that he had never made his children develop affinity to the State as their motherland. That is why his children do not know Oriya. So, for Navin’s not knowing Oriya, more than him, his father Biju deserves censor. However, after demise of Biju, when his factotums well trained by him to cheat Orissa, succeeded in their tricksterism and thereby Navin replaced a decadent congress ministry that had forfeited all political credibility, he should, knowing that he may rule over Orissa for a few years, have addressed himself to learn the Oriya language. But he has not. Either he has no ability to learn Oriya or no aptitude to learn. But when British had occupied the country, an officer of Madras Civil Service, Mr. T.J.Malthby had authored and published “A Handbook of Uriya Language” mainly for the non-Oriya officers serving in the Oriya speaking districts of Madras Presidency. This book gone out of print, government of Orissa purchased its copyright from the daughter of Malthby and republished it with updates in 1945 under the title “A Practical Handbook of the Oriya Language”. With the help of this book, non-Oriya officers belonging to National Civil Services are fluently speaking Oriya within a few months. Navin could have taken help of this book to know the Oriya language. But like his father, he has no real loyalty to Orissa. He is more conspicuous in reducing the Oriyas to landless condition in order to handover their lands to non-Oriya trade and industry operators. When after endangering Orissa’s lands and natural resources he started playing mischief with the archaic uniqueness of Oriya language, in a hope against hope to show him as to why Orissa should not be Odisha, as thereby the archaic heritage preserved in Oriya grammar and pronunciation would be affected, I had attached to my mail to him the portion of this practical handbook where the peculiarity of use of “d” and “r” has been mentioned. But he did not pay any heed. Perhaps, after pushing Orissa into the labyrinth of chaos, he is in very much want of ways to hoodwink the people. So, he wants to create a confusing aura of Oriya nationalism in the guise of spelling of the name of the State and to use it as a camouflage to get people off their guard during elections that are not far away. But why some others specifically amongst e-mailers are raising the chorus for change of Orissa into Odisha? Perhaps, they may change on perusal of this posting or on further research at their respective levels. But if one is unable to understand the intricacies of Oriya language, it would be better for him or her to appreciate that motherland Orissa has many names like Odra, Udra, Uddiyana, Oddiyana, Utkal, Kalinga, Kosala, Tosala, Orissa, Udisa, Udishya etc. Call in any of these name, only she will thereby be addressed. There is no necessity to change or drop any of them. What is that to us if Bombay became Mumbai or Calcutta became Kolkata or Madras became Chennai? Why should we belittle ourselves to be affected by that? Our motherland has many names with glowing history of heritage behind all of them. We have a place of pride under the Sun as an ancient nation of matchlessly creative people who are second to none in uprightness and valor. If we have any reason to feel dejected and want to be extricated from that, we are not to imitate name changers of Bombay or Calcutta or Madras, we are to reject the name changers of Orissa, who are harping on this to divert public attention from the damage they have done to this splendid soil. It should be noted that the State Government of our age-old rival and immediate neighbor Andhra Pradesh has been rendering full support to the claim of Telugu Language for classical status. In view of the determination arrived at under Linguistic Survey of India, our State should have raised the demand for Classical status ahead of or at par with Andhra. If we raise the claim, and we ought have to raise it either through the Government or as a people, every iota of classicism of our Language needs be meticulously preserved. Therefore, the the English spelling of the names of our motherland and mother tongue, bearer of our archaic distinction, must not be changed to the spelling, which the Oriya-ignorant Naveen Patnaik and the sophomoric politicians of the State are preferring. I fully agree with your arguement about the classical name of Orissa, which is based on facts and historical documents. I feel all Oriyas should oppose such a move by headless people, who have no contribution for this great State , its rich language and heriatage. Thanks for bringing such facts to light for information of people of Orissa and the world also. 5RF/5, Unit-3, M.G. Marg, Bhubaneswar-751001.